As a parent who is going through a divorce or planning on filing for divorce, you may be curious as to how child support will be calculated in your particular case. The terms of each child custody and child support agreement will be different, as no family situations are the same and neither are a child’s individual needs. In our state there is a standard schedule which is used to determine the amount of support a child will be given. The combined gross monthly income of both parents, along with the number of children from the marriage who require support, are some of the primary factors used to determine the amount of child support which is to be paid. If you want to find out how much you can expect to pay or receive in child support payments, a divorce lawyer from our firm is only a phone call away. 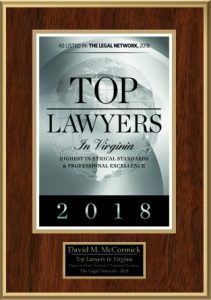 The lawyers at the David McCormick Law Group understand how difficult it can be to put an end to a marriage that has had so much invested into it. When there are children from the marriage, there are often many more complications which can arise. Most parents want to do whatever will be in their child’s best interests and they want to take measures to see that their child will be able to receive proper care, medical attention and more until the child is legally able to care for him- or herself. We are here to represent your interests, as well as advocate on behalf of you and your child. Throughout the duration of your divorce proceedings, we will be committed to providing you with the stability and sense of assurance you need. If you are going through a divorce or dealing with a family law issue such as child support and custody, you are not alone. Contact our firm and schedule to meet with a Virginia Beach divorce lawyer from our firm right away.